The threats to the Richmond Birdwing Butterfly are both natural and man made. It is unfortunate in some respects that the Richmond Birdwing and people enjoy the same environment. In earlier years the need for more and more farming land for dairying and in later years, small crops such as pineapples and other tropical fruits, led to the destruction of a significant amount of Richmond Birdwing habitat. In more recent years, the rapid rise in the need for residential land, much of which was on former farm land, has continued the degredation of birdwing habitat. With the rise in residential colonization, ignorance has led to further degredation. A misconceived perception that vines and trees do not belong together and that any vine is bad, has led to many landholders removing all vines growing on their properties, resulting in the subsequent destruction of much birdwing habitat. In any of our subtropical rainforests, vines form more than 50% of the forest canopy. Education is slowly reversing this trend. The Double Helix Club, an initiative of CSIRO, the Richmond Birdwing Recovery Network and Richmond Birdwing Conservation Network, have been instrumental in reducing the decline in habitat, but still more has to be done. Community based workshops, information booths and the establishment of community nurseries in which larval host vines are propagated, are some of the mechanisms being used to encourage people to grow vines in their gardens, life-style blocks, and in habitat from which old growth vines have either been removed or have died. Habitat destruction and drought are two of the prime causes leading to another threat to the butterflies survival - in-breeding depression. To understand this, one has to look at the biology and behaviour of the butterfly. Richmond Birdwing Butterflies are not normally migratory. To maintain strong and viable populations, there must be plenty of opportunity for females to mate with non-related males. The female Richmond Birdwing butterfly is known to fly up to 30 kilometres from where she pupated in order to lay her eggs on suitable vines. Strong populations of birdwing butterflies ensure that there is enough genetic diversity in subsequent generations to ensure the species continues. Brother sister matings result in infertile eggs and the potential loss of a generation of butterflies. Fragmentation has resulted in the isolation of many populations of butterflies. While an isolated population may initially be strong and viable, lengthy drought events, as there has been between the 1990s and 2008, has seen these populations dwindle in many cases to extinction. To bring the butterfly back to these areas, habitat corridors with large and numerous vines have to established, linking existing strong populations with former with the areas where the butterflies are now extinct. This process can be hastened by the development of captive rearing programs and the release of genetically strong butteflies into areas facing extinction. Many of the areas from which the butterfly has been extinct for some decades may never see the butterfly again. This is due to other threats such as complete loss of habitat and climate change. 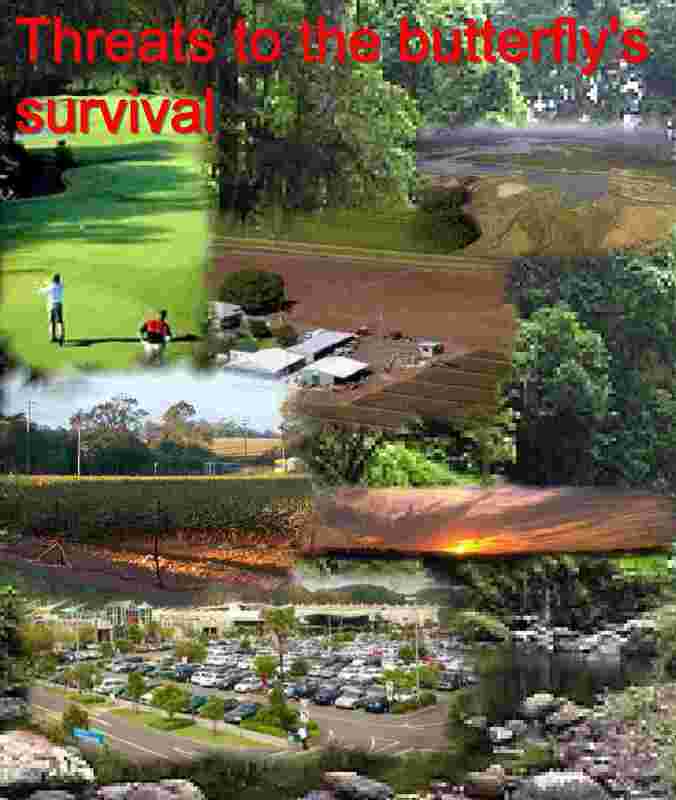 Given limited resources, target areas should be those with the greatest potential for recovery. Click here for more information on in-breeding depression. 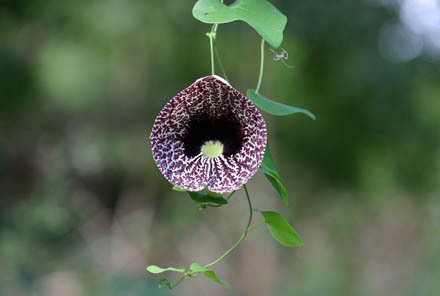 In the 1900s, the nursery industry, ignorant of many of the environmenal issues, released onto the unsuspecting public, the vine Aristolochia elegans. This vine is commonly known as the Dutchan's pipe vine. Why? The flowers were showier, larger and more colourful than the native Arisolochias and Paristolochias of the local area, just what gardeners were looking for. At the time and unbeknown to the nursery industry, these South American vines became devastating to the Richmond Birdwing larvae, causing 100% mortality in any birdwing larvae which hatched from eggs laid on these vines. Death occurred within the first 3 instars from poisoning. Furthermnore, the female Richmond Birdwing Butterflies seemed to be attracted to, and prefer to lay their eggs on these dangerous vines than on the native host vines, Pararistolochia praevenosa and P. laheyana. This vine is no longer sold in nurseries, but many of these weedy vines have already found their way into the sub-tropical rainforests of SE Queensland and Northern NSW from seed from vines planted in gardens and continue to devastate the viability of the Richmond Birdwing populations. The Dutchman's Pipe is also poisonous to many other animals including sheep and cattle. Drought is an event that has affected the climate of Eastern Australia for centuries. Two major impacts on the Richmond Birdwing Butterfly brought about by drought are the scarcity of soft leaves for newly hatched caterpillars and the drying our of pupa due to low humidity levels, causing the death of many of the pupa. Prolonged drought from 1998 to 2009 has had very serious impact on the Birdwing populations and distributions. The egg laying female butterflies look for the soft leaves on the P. praevenosa vines on which to lay their eggs. These leaves are mainly found in the upper levels of the canopy on the mature vines. In times of drought, the vine may not produce new leaves. The older tougher leaves are not edible to a newly hatched larva. Climate Change has implications for the number of life cycle generations per year, survival of sensitive immature stages, ability of adult butterflies to find sufficient nectar, and the production of seed capsules for the food plant vine. If forced to move south to find suitable climate, the butterfly must find sufficient vines on which to reproduce.